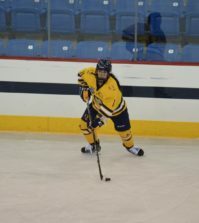 After blanking Rensselear 2-0 Friday, the Quinnipiac women’s ice hockey offense continued to perform well as they defeated Union 5-1, Saturday afternoon at Messa Rink in Schenectady, N.Y, extending its all-time record against Union to 17-0-3. The Bobcats second consecutive road win improves their record to 2-0 in ECAC Hockey and 3-5 overall, while Union falls to 0-2 in ECAC Hockey and 2-7 on the season overall. 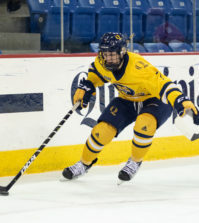 The Bobcats (3-5, 2-0 ECAC) continued their balanced offensive attack by scoring a goal in each period. Quinnipiac scored two goals in the first period. Breann Frykas blasted a slap-shot from the point for her first goal of the season off a pass from Olivia Brackett and Kate Wheeler at the 4:20 mark. 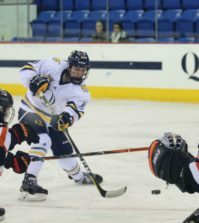 Quinnipiac’s offense kept pushing the puck into the offensive zone, eventually extending the lead to 2-0 on the stick of Amanda Colin. Bobcats’ Amanda Colin and Nicole Kosta had a great scoring chance as they had a two-on-one into the Dutchwomen’s zone. Kosta skated down the left wing before saucering a cross-ice pass to a streaking Colin, who tapped in her first goal of the season past Union (2-7, 0-2) goaltender Alana Marcinko. Junior forward Brittany Lyons earned her fourth assist of the season. The Bobcats added a lone goal in the second period to increase their lead to 3-0 when Kelly Babstock scored her team-leading fourth goal of the season seven minutes into the period at the 13:05 mark. Shelby Wignall received a pass from Felicia Vieweg in the defensive zone. Wignall found an open Babstock, cutting across the ice. Babstock corralled the bouncing puck and wristed a shot over Marcinko’s blocker and into the back of the net. The Bobcats added two goals in the third period, just 30 seconds apart, to put the game out of reach. Kristen Eklund scored the first goal of the period just following a poke check in which she stole the puck from a Union defender in the offensive zone. Eklund controlled the puck and blasted a shot over Marcinko’s shoulder for her first goal of the season. Senior Jordan Elkins scored her second goal in consecutive days as she deposited a shot that found the back of the net at the 1:36 mark of the third period to ice the game with a five goal lead. Emma Rambo scored her first goal of the season for the Dutchwomen at the 6:03 mark of the third period to bring the score to 5-1. Bobcats’ goaltender Victoria Vigilanti followed up her first shutout of the season against ECAC foe Rensselaer with another solid performance between the pipes, stopping 19 shots on the afternoon. Union goaltender Marcinko made 21 saves before being pulled after the Bobcats fifth goal for senior Kate Gallagher, who turned away three shots. The Bobcats outshot the Dutchwomen, 29-20, including 24-11 through the first two periods. Both teams were shut-out on two power-play chances. Quinnipiac returns to the ice on Friday, Nov. 4 for their home-opener against ECAC rival Yale at High Point Solutions Arena at 7 p.m.